Internet cafes, also called in Japan "Manga Kissa", are very particular places to stay. premise: in this page I will talk about internet cafes mainly as places where staying in the night and sleeping, but you can also go in these places for few hours to have a rest or surf the internet at any time of day. They are open 24 hours on 24 and, as well as offering the traditional PC workstations with a chair to surf the Internet (called "Open seats"), also offer some "cubicles", a little more expensive, which can be used, with great ability to adapt (I want to emphasize this sentence), even to sleep (and they are called "Personal seats"). They are small rooms no more than two meters long and wide less, usually equipped with a computer, a pair of headphones, a TV, sometimes a console. There are those in which you sit on a reclining armchair and those with a soft floor on which you may lie down. 2. Go only when you decide to go to sleep. Internet cafes can't be booked, but generally they always have seats available, especially before midnight. After midnight, with the closing of the subway, these places are crowded of salary-men who decide to spend the night in these places near the workplace after having missed the last train to come back home. 3. Ask if there is a seat available. They will ask you what type of seat you want (open or personal), and in the case of a private seat (the "cubicle") they will ask if you prefer the reclining seat (reclining armchair) or the flat seat (soft floor), or any other types of accommodation, but these are the most common. 4. Say how much time you intend to stay. It is good to specify how long you intend to stay because if you will stay more you will have to pay an extra rate more expensive than the standard rate. Usually, to stay all the night you don't pay the fee by the hour but there are packages that include a certain number of hours (usually 6 or 8 hours). One night in an internet cafe cost me around 2,000 yen (18 euros with the current exchange rate). 5. You may be asked to pay in advance, depending from the internet cafe. After that they will give you a card (that you must show when you exit to show that you haven't to pay any supplements) and you can go in the cubicle where you have been assigned. These things are available in many Internet cafes. Other Internet cafes may also offer shared recreation rooms with for example,pool tables, or sauna or other. Personally, I went to Japan with only a hand luggage and a backpack so I could bring all in the cubicle. But if (as it is in 99% of cases), your luggage is larger than mine, don't take it with you because your stay could become much more uncomfortable than it already is. Before going to the internet cafe you can leave your luggage in a coin locker. What are coin lockers? They are the same as western PCs, generally they have Windows installed. The keyboards have Western characters. Unlike our internet points where you can only surf the internet in a japanese internet cafe you can do whatever you want, download and install any software and any use. For each new user the computer reboots and resets automatically. 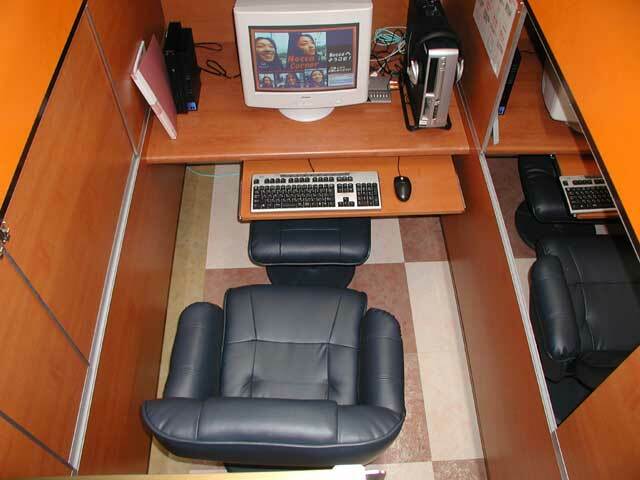 Sleeping in an internet cafe may be comfortable or not depending on the person. However, besides the low price, which is still similar to that of many hostels, there is another positive aspect: this is a fantastic experience that immerses you completely in the urban society of the megalopolis of Tokyo or some other big Japanese city. I recommend this option to: to all those who are traveling alone and want to save as much as possible, or want to get as much contact as possible with the Japanese metropolitan society. I don't recommend this option to: people who travel in groups, or generally to people who have difficulty getting to sleep even in bed at home, in an internet cafe they wouldn't be able to sleep.